Whether you’re stuck in a costume rut or just can’t get inspired. We’ve trawled the internet for ideas and we hope it inspires you! Heidi Klum- is the master for such an occasions. True she has a number of specialist makeup artists and prosthetics experts on hand to pull off her muses but we can certainly take note. For copyright reasons we cannot illustrate her Halloween looks over the years but this Telegraph article takes a look at 16 years worth of Heidi’s styles! Another star we always look to inspiration for such an occasion is Lauren Conrad. Lauren is a major Halloween fan and not only showcases her costumes over the years, including inspiration for the coming year, but she explores treats, home decor and themes too! This year you can find ideas for circus performers, couples costumes and flapper girl over on her site; and you’ll not have a need for specialist makeup artists here and it’ll certainly be more cost effective too. If you’re looking for ready made, Beyond Retro is the place to go. They’ve an extensive range of vintage, costume and accessories at really reasonable prices. 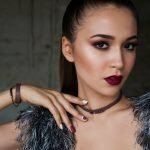 Beauty Tips: How and Why To Highlight/Strobing Wonder what highlighting can actually do for you? We share why you highlight and how.